No assembly needed. Take the desk out of the box and set up on your existing desk in just a few minutes. Dual-tiered and wide work surface. Remains sturdy even at maximum extended height. Costs half the price of its rivals. Comes in two colors: cherry and acrylic. The desk is heavy to lift and carry. Some users complain about the desk standing at an awkward height or higher than what is comfortable when fully lowered, which may cause eye strain and neck pain. Other users say the desk gets clunky when adjusting from sitting to standing, but it is easier to raise it than to lower it. Standing is one of the simplest ways to avoid the many side effects of a sedentary lifestyle, as well as to double your productivity in the workplace. 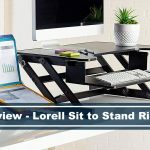 If you are looking to buy a standing desk to start a healthier lifestyle, you might want to consider this crowd favorite. What Makes this Product Great? When it comes to standing desks, one of the crowd favorites is Halter’s ED-258. Most of its reviews are positive, and users rated it 4.5 stars on Amazon, which is not bad at all. 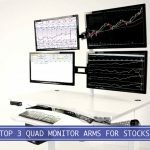 Let us take a closer look at what makes this standing desk one, if not the best standing desk available on the market today. This standing desk comes fully assembled. You can take it out of the box and set it up on top of your existing table within minutes. It seems like a minor factor to consider but think about the convenience and ease of setting up. No screws to lose, no mess of putting things together, and no more time to waste. With this desk, you can get back to work in no time. Halter ED-258 is a two-tiered desk with a spacious work surface. The elevated desktop is for your monitors and the lower level for your keyboard, mouse, and other desktop items. The ample space is good for a healthy wrist movement. The height of the desk can be adjusted to a maximum of 16.14 inches high and remains sturdy at the extended height. One issue some users complain about is that when the desk is fully lowered, the height of the desk is a bit higher than what is comfortable. This could cause eye strain or neck pains, which ultimately defeats the ergonomic purpose. 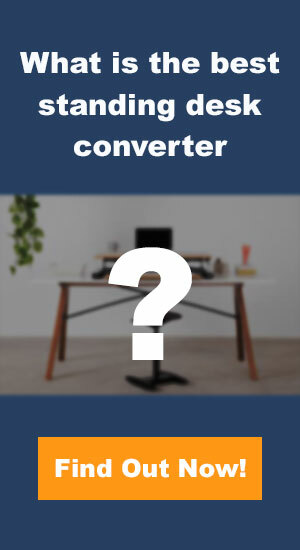 If this is a big factor, check out a list of standing desk converters we reviewed. Take note that not all users have the same experiences. If this happens to you because you ordered your desk online and never had the chance to test it out, you can adjust your seat instead and raise it higher to match your desk. If it’s still uncomfortable and frustrating, then maybe this desk is not for you. One important factor that you should consider when buying a standing desk is its stability at maximum extended height and the stability when you put pressure on it as you type or work. Halter’s standing desk surprisingly remains sturdy with weight and pressure for half the price of its rivals. The handle on each side allows for an easy adjustment from sitting to standing position. You’ll have to squeeze the side controls to raise the desk and release them to lock it in place. However, the transition from sitting to a standing position is a bit challenging for some. Raising the desk sometimes get clunky, but it is easier than lowering it, especially when your equipment and desktop items are on it. The desk has a weight capacity of 44.1 lbs and can handle a two-monitor setup like a champ. Having a dual-tier and a wide surface made this desk big and heavy. People with bad backs should not even try to lift this desk to avoid more damage. Even individuals who love this product complain about its weight. You might want to call someone for help if you are planning to change location from your desk to the porch. This won’t be too much of an issue if your desk stays in your cubicle or workstation. On a positive note, you would want a desk that has a wide surface and doesn’t wobble even at maximum height. So naturally, you should expect the desk to be massive. If you want a well-built standing desk that costs only half the price of its competitors, this one is the perfect one for you. The warranty lasts for a year. As mentioned, there are ways around the cons, and they do not happen to every user. Overall, Halter’s ED-258 height-adjustable standing desk is a great buy. The advantages trump the disadvantages, and the quality of this desk guarantees that you’ll get your money’s worth. This desk is made to last and can help you get things done more healthily and positively.